Hope all are doing well and enjoying the winter! Wayne Riley and I made a mad dash to Mt. Rogers this Friday for a weekend in Rogers weather. COLD, SNOW and more COLD. When we arrived Friday night NOT a bit of wind all the way to the pine trees. With snow from the past week of about 10 inches. A nice warm 20 degrees as we set up the tent. Great view of the sky and ski slops and no wind! Over night fresh 2 inches of snow, nice 17 when we got up for a warm breakfast of srimp and grits – – – in the tent. We did a few hikes all over the place. Yes Infoman I did find the new camp site! Lunch back at the tent and of course a nap for 1 to 2 to recover from walking in snow drifts two feet +. 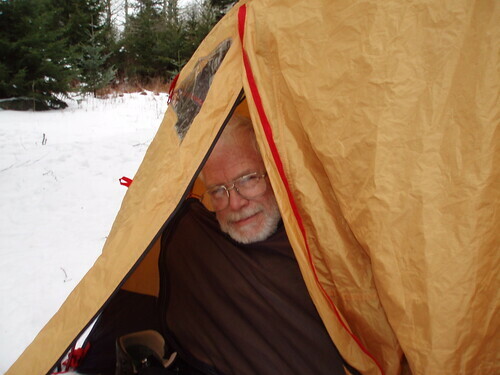 That afternoon Wayne went on another hike I stayed in the warm tent and read a book. After a great dinner Wayne brought he went to sleep at 7:30 me I was reading some more but after the third time the book fell out of my hands I also said good night. THEN THE MT. ROGERS WINDS COME! ! Strong winds from hell all night. Going out to take care of the needs was no fun!This morning 18 degrees, still strong winds with the whole Mt. covered in rim ice. What a winter wonder land it was. We hiked down and went to highway 16 and 58 and had a breakfast with a scout troop that was around the bend from us. They all talked about how cold they where. One asked how two old people could stay warm. WE JUST SMILED! As always “MAY THE ADVENTURE CONTINUE”! ! ! !